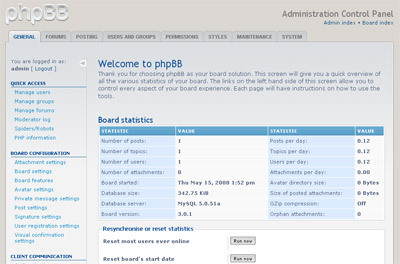 phpBB, one of the most pupolar forum software released its newest version phpBB 3 not so long ago. So, what’s new in phpBB 3? What makes it better than other competitors and what made Joomla.orgofficial forum migrate from SMF to phpBB not so long after phpBB 3 was released? phpBB3 is full-packed with lots of new features compared to the previous version. According to it’s developer phpBB 3 represents over 5 years of hard work on development process from some of the most talented web developers in the world. And why did Joomla.org migrate their SMF-powered forum to phbBB 3? The guys at Joomla.org said that although SMF was great, but it wasn’t licensed under GPL. As a result many of Joomla users who like to follow the choices Joomla.org developer made were going to run in to integration issues in the future. They also added that the team at phpBB have been great, with many of them offering to help. Still curious about what phpBB 3 can do for you? Why don’t you give it a test on your localhost and see how it goes from there.